2013 Greeves Days was one to be remembered for the books. The founder of Greeves Days the late Frank Conley who passed away in October of 2012 was honored. Frank who had been putting on Greeves Days since the mid eighties asked to pass the annual event on to me and land owners Mike and Lupe Beanway. Frank's wife Luana was very gracious to Kathy and me to continue on with keeping the event going and supplying Greeves parts worldwide per Frank's wishes. To keep the popular once a year event for Greeves enthusiast alive was a task that had to be tackled head on. The program was always well organized by Frank and in the later years Frank had me and Mike doing the judging and some organizing, so we had some understanding what to do in organizing the event. On hand was long time friend and partner Shep Shepherd who was always Frank's Right Hand man for so many years. Shep in the later years helped Frank out so much when Frank began physically slowing down. The event started off with a lot of nervousness on my part, just hoping for a good turnout. As the vehicles started rolling in and Greeves being unloaded, a collective sigh of relief came soon. As we all gathered together, a moment of silence was held, with Frank's QUB standing by itself in front of the gathering friends of Frank. A few stories were shared by me with me sometimes fighting off the emotional feelings from so many good times we all had these past 25+ years. As the Greeves lined upped I think about forty were counted. The best in show awards were the same as in the past, but previous winners were now back in the running for the special trophies presented to the winners. Best early Greeves went Don Kelley with ex Gary Conrad 25DC. Best Griffon went to Rick Nabers and his model 58 Griffon 380. The special trophies presented were re-produced Nick Nicholson Motors posters that Nick would post on his showroom window displaying the many wins on Greeves. 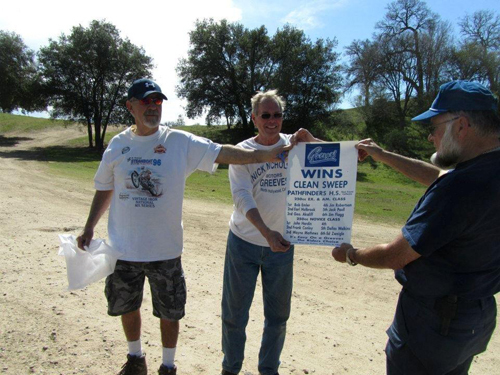 This particular poster had Frank's name on it for his good showing at a desert race from the early sixties. After the awards were presented, it's traditional to break off into teams and setup 8 or 10 traps for the following day trials, with others who were not participating in Sunday's trials, it was their chance to hop on their scramblers and take in a few laps on a track prepped by Mike. As the day ended the band of Greeves brothers and sisters headed down the road to the Pozo Saloon for some good food and a beer or two. A toast was in order for Frank with more laughter and stories to tell. It was a memorable first day for all. Sunday morning came and I think bets were on amongst the clan if I was going to be on time to get the trials running off in good order. Kathy and Ginger Hilgenberg were signing up riders for the event which helped me a bit so I could get ready to hop on my Pathfinder for the trials. With great weather, good dirt and green grasses, I made it clear in the riders meeting that section had to be fun and not too difficult for our senior members. Enjoying my day and taking in the many smiles and laughter's it all looked like we pulled it off for Frank. A great day for all but a sad one as well without the "Greeves Guru" Frank Conley. This one was for you Frank. Cheers! Don Kelley was the recipient of best in show for early Greeves. Nick Nicholson Motors poster featuring Frank Conley. Last year we ran out of 380cc Pistons for the Griffons. But the good news is we have a very large supply of 360cc pistons for the 34MX4, which is the same piston as the 380cc except the bore size. You can have your cyld resleeved to fit a Std 360cc piston and the best news is they come in Std,+010 +20 +30 +40 +50 and +60 and we have a large supply of Rings to fit all sizes. The 380 Griffon piston only came in Std. +20 +40 +60. We still have Piston rings for the 380cc, but sorry no 380cc pistons. The fellows that have fitted the 360cc pistons have reported wins and claim you can't tell any difference in power. We do have pistons in stock for the 250cc Griffon and 24MX6 short stroke Challenger and rings in all sizes both, Dykes and 1/16" types. 2009 Greeves Days are now history, but we can look forward to 2012! Mark your calendar for Feb. 11th and 12th, 2012. This past announcement for Greeves Days is here so those that haven't been there before can get the directions. Mark your calendars for the 14th and 15th of February so you don't miss another opportunity to enjoy these great old bikes. The event is free and limited to Greeves motorcycles. 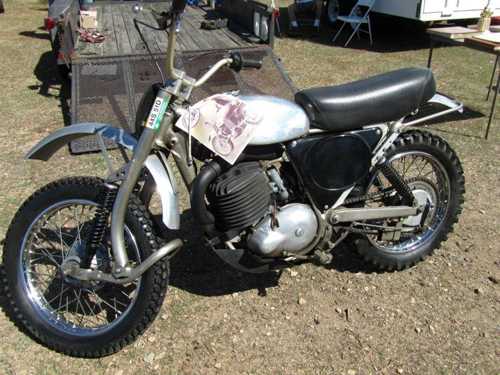 Saturday will feature the bike show with awards for Best Trials, Best Challenger, Best Griffon and Best Early Greeves. Judging will commence at noon. Sunday will feature the vintage trials with as many as 10 sections. Competition begins at 10:00 am sharp. Accomodations can be found in San Luis Obispo, Atascadero or Paso Robles. Checkout the web for available hotels, or stay at one of the many bed and breakfasts. If you like to camp, you may do so under the oak trees on Mike's ranch, site of Greeves Days. From San Luis Obispo, go North on 101; from Atascadero head South on 101. Take the exit to Santa Margarita. Drive through town, and turn right at the end of the main drag, over the railroad tracks. You should be going east on "Pozo Road." Take this road past the turnoff to Hwy. 58, and after about 3 miles you will pass the turnoff for Santa Margarita lake. STAY Right. Continue on Pozo Road about another 10 miles. You will enter the town of Pozo. Make a mental note of the location of the Pozo Saloon on the North side of the road. We all gather there on Saturday night for beer and food (unless there is a BBQ scheduled for Saturday night at the ranch!). Anyway, continue east-ish on Pozo road. The road will curve Northward a bit. Continue on the road, and keep straight at the upcoming intersection. You don't want to go to Pozo Summit, but instead to Turkey Flats. The turnoff to Turkey Flats will be on the right. Turn right towards Turkey Flats. About 1/4 mile down the road on the right you'll see a Greeves banner marking the entrance to Mike's ranch. Read a letter from Dan Danmeier praising Frank Conley's contributions to the British biking scene in California. 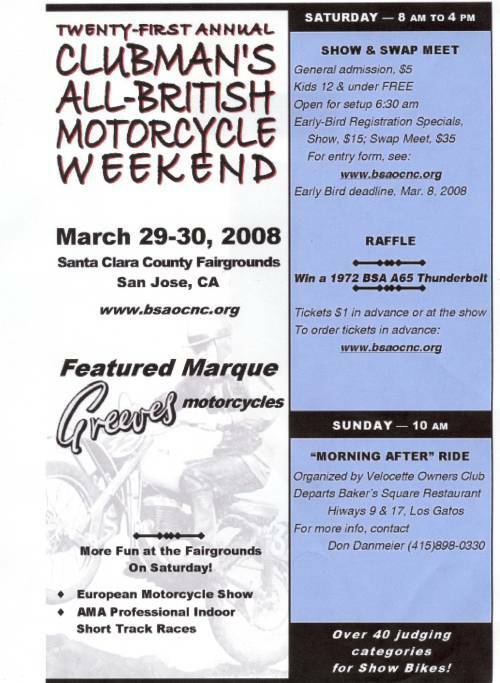 Enter Your Greeves in 2008 The BSA Owners Club will be featuring the Greeves mark at their San Jose show in 2008. Finish that restoration project and plan to be there. It is always an excellent show. 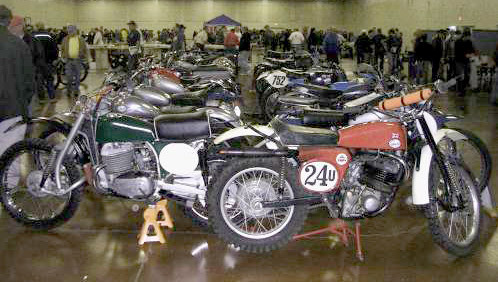 Many greeves motorcycles are lined up for the 2008 BSA Owners Club show in San Jose, California.